takes you to the top of the hills! 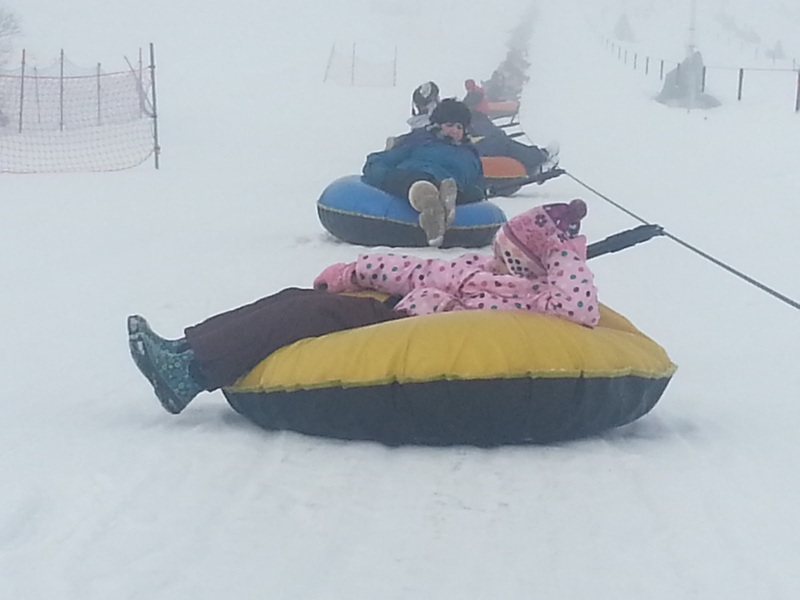 My kind of tubing! 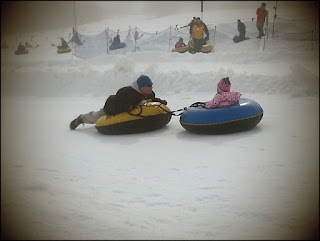 We recently enjoyed a fun family day tubing at Soldier Hollow. It was our first time there, and is an experience we will be talking and laughing about as a family for years to come! We stayed the night before at the Zermatt Resort and Spa in Midway as part of our Tubing and Lodging package. READ OUR REVIEW of the Zermatt. ﻿﻿When you arrive, you have a two hour time slot in which to enjoy the tubing hills. Because they limit the amount of people per time slot, it doesn't get over crowded. Even when there are a lot of people, it doesn't seem overwhelming. I recommend reserving your spot ahead of time. Tickets can be purchased in advance with a credit card at (435) 654-2002 or in person at the Lodge. We rarely had to wait in line for the tow rope or the tubing hill, and we went on a Saturday morning. Our time slot was 10am to noon. In that time, we were able to experience all six tubing lanes. My 9 year old daughter was a little bit nervous, and only tried lanes one through three, but my 7 year old son was adventurous and tried all six lanes with me. Our favorites were lanes five and six. to your child's tube, and go down the hill together. Make sure that you arrive about 10 minutes before your start time in order to get in as many runs down the hills as you can. Get checked in, suited up, and ready to go by the time your tubing time begins. You will have to sign waivers for each person in your group, so make sure you allow yourself enough time to get all of that done. Make sure the kids all use the restroom before heading over to the tubing hills! I remember going tubing and sledding as a kid, and dreading the walk up the hill carrying my tube. At Soldier Hollow, you connect your tube to a tow rope that takes you up the mountain to the top of the hill. Sit back, relax, and enjoy the ride up! No walking and getting tired on this tubing hill! A sound system playing fun tunes adds to the enjoyment. The tubes are included in the price you pay for tubing, and you can pick and choose which tube you want to use. Don't like the tube you just went down the mountain on? Trade it for another one! They have a spot where they are all laying in a pile, so picking out a new one is easy. Tubing hills are groomed each day, making it a safe alternative to going out and finding your own hills for tubing. Make sure to wear heavy-duty boots, because towards the bottom of the hill you will see orange cones; start dragging your feet when you see these so that you can stop before you get to the bottom. At the end of each hill, there are nets to catch you from going too far if you are going so fast that you can't stop. A friendly staff member is positioned in many different spots of the tubing hill, and ready to offer assistance if needed. To prevent too many people from going down at once, they communicate with the staff member at the bottom of the hill to make sure it's clear and ready for the next person. This was one of our favorite family adventures we have ever experienced, and we can't wait to go back and bring our family and friends! I was provided with four complimentary tubing passes at Soldier Hollow for my review. I was not compensated financially, nor was I persuaded to write any specific type of review. The opinions and views expressed in this review are all my own.